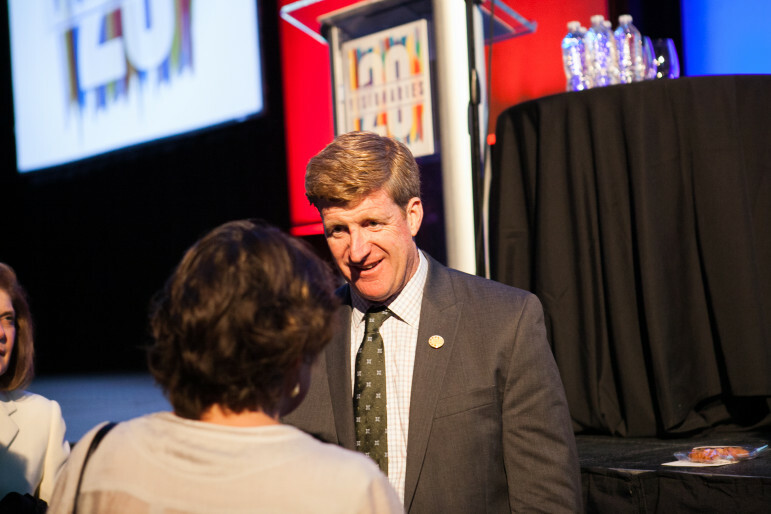 Former U.S. Rep. Patrick Kennedy speaks at the mental health symposium. Former U.S. Rep. Patrick Kennedy speaks with an attendee at the Zarrow Mental Health Symposium. Four out of five people who kill themselves in Oklahoma are men. Law enforcement officers are only beginning to learn how to deal effectively with the mentally ill.
Society as a whole, including the medical field, often fails to see the relationship between mental and physical health, leading to tragic outcomes. Those were among the key messages imparted at a mental health gathering in Tulsa on Thursday and Friday attended by nearly 700 people, including advocates, funders and professionals in mental health and law enforcement. The theme of the 20th annual Zarrow Mental Health Symposium was “All Things Prevention,” with panels and speakers focusing on new approaches to treatment and prevention of mental illness and addiction of many forms, from prescription drug abuse to eating disorders. In Oklahoma, the problems with mental health are severe, evidence shows. 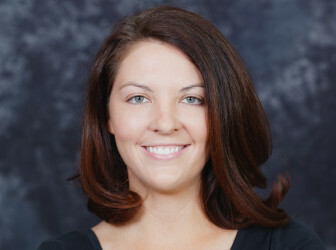 During an overview of suicide statistics, Savannah Kalman, who leads suicide prevention efforts for the Oklahoma State Department of Mental Health and Substance Abuse Services, said it’s clear Oklahoma has a suicide problem. The suicide rate for those aged 24 to 65 nationally is 12.7 people per 100,000 residents. That compares with a rate of 24.9 in Oklahoma. The state ranked 13th in the nation for rates of suicide in 2010, but jumped to seventh by 2011, according to data presented by Kalman. The biggest challenge is getting men in Oklahoma to seek help if they are struggling with depression, divorce or another crisis sparking suicidal thoughts. In Oklahoma, men commit 79 percent of suicides, she said. Kalman noted that men are least likely to visit the doctor for routine preventative doctor exams. The department has been using an ad campaign aimed at men, deploying humor to try to get them to seek help. “We need men to find a way to say, ‘It’s OK to get services, and I know where to get them,’” Kalman said. The state is also reaching out to students because suicide is the second leading cause for Oklahoma youths. The state passed legislation this year that expands a suicide prevention curriculum into schools. The goal is to help students or staff to recognize problems and intervene or make proper referrals for help. The state also provided funding for training and curriculum development. Kalman said data shows students or teachers who know how to discuss suicide are more likely to have those discussions. Raising awareness is just a part of prevention efforts. Kalman said many people visit their primary physician in the month or days before committing suicide. That presents another challenge for Oklahoma. A key factor discussed Friday is improving how law enforcement responds to residents suffering from mental illness. Ernest Stevens, an officer with the San Antonio Police Department, said more communication and collaboration is needed among law enforcement, mental health and physical health officials to ensure mentally ill residents get the help they need. San Antonio is in the spotlight because of changes started in 2010 that are aimed at placing people who commit misdemeanor crimes in treatment instead of jail. Stevens, who was part of a panel on how communities respond to mental illness, said only 6 percent of people with a mental illness who were diverted to a treatment program ended up in jail for violating the terms of their probation. Some of those policies may be seen in pending changes at the Tulsa County Jail. Robert Walker, a corrections officer with the jail who was on the panel, said the focus on addressing mental illness in his facility represents a cultural shift in the community. The jail is partnering with non-profits and local agencies to put together a program that will help evaluate whether people coming to the jail are suffering from a mental illness, and what treatment is needed. Walker said the Tulsa County Sheriff’s Office is also looking at what that will mean for the design of a new jail. As part of its reforms, San Antonio created drop-off facilities that provide mental and physical treatment; that allows officers to quickly return to the street while ensuring residents get the help needed. The police chief in San Antonio also required in 2010 that all patrol officers be trained in how to respond in a crisis involving someone suffering from a mental illness. The department will meet that goal by the end of next year. Stevens said officers are traditionally trained to handle a situation by addressing whether a person is a threat to himself or herself, or to others, but there is another option: Treat according to signs of mental illness. A person may also be “mentally decompensating,” meaning their mental functions are deteriorating. Stevens pointed to situations where officers not trained to handle a mentally ill resident may end up shooting the person, which can spark a community backlash. “If you’re hallucinating, you’re not homicidal or suicidal, you’re mentally decompensating,” Stevens said. 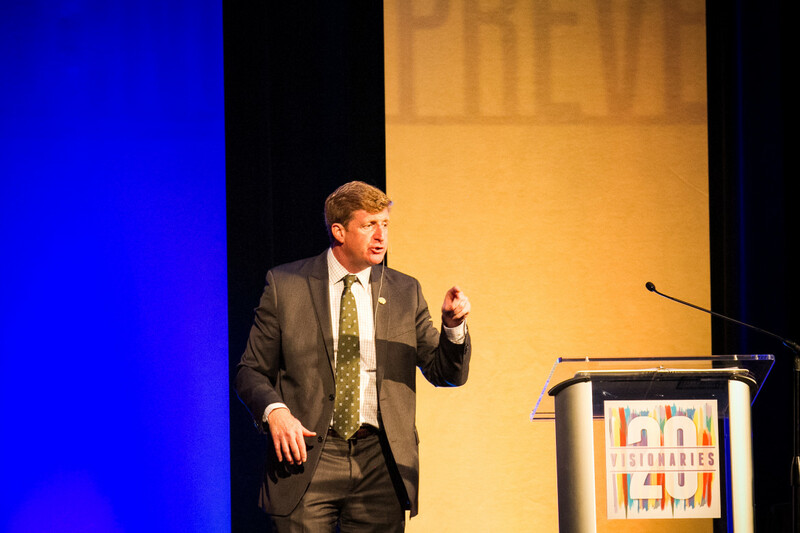 Former U.S. Rep. Patrick Kennedy, D-R.I., a keynote speaker on Thursday, drew on his own battles with addiction and bi-polar disorder as he talked about his fight to gain support for the Mental Health Parity and Addiction Equity Act in 2008. The bill requires that group insurance providers offer the same benefits for mental health and addiction treatment as they do for physical health treatment. Kennedy, who became the bill’s primary sponsor as a junior congressman in the minority party from the nation’s smallest state, equated the push to a civil rights issue. Kennedy was convicted of driving under the influence in 2006, but he said several congressmen, including Republicans, came to him after his arrest to talk about their own experiences with addiction or mental illness. One talked about a father who had committed suicide with a shotgun and another about a daughter suffering from an eating disorder. Those same congressmen voted against the mental health equity act due to the stigma associated with mental illness and addiction, Kennedy said. “I will not betray their confidence, but that’s what we’re dealing with,” Kennedy said. Kennedy praised former Oklahoma Rep. John Sullivan, a Republican, for his support of the bill. Sullivan introduced Kennedy during Thursday’s keynote speech. The bill ultimately passed after it was included in the 2008 bailout of the U.S. financial system. Kennedy said society still needs to address the disconnect between mental wellness and physical wellness. As an example, he shared a story of visiting his doctor after he was caught driving under the influence. Kennedy told his doctor he was in a 12-step program, was seeing a counselor and had an addiction problem. During the visit, the doctor only asked questions about his physical wellbeing. When Kennedy said he had back pain and asked for a prescription of OxyContin, the doctor obliged despite knowing about his addiction. Note: Oklahoma Watch, which covers mental health, has received grants totaling $35,000 from the Anne and Henry Zarrow Foundation and the Zarrow Families Foundation to support a yearlong project on mental health.